Many studies have shown that fuel demand is quite elastic and that the best way to reduce fuel use (to tackle climate issues) is by taxing fuel. Yet it seems almost impossible to do so, particularly in those countries with low prices and high demand. The purpose of this paper is to cast light on the difficulties of raising gasoline taxes by analyzing the determinants of gasoline taxation. We believe that one of the reasons for the difficulties is that political pressure influences the political decisions regarding taxation of gasoline consumption. Not only do low taxes and thus low prices encourage high consumption, but high levels of consumption also lead to considerable pressure against raising the taxes. Our findings also point to the significance of other factors such as government debt (a higher debt leads to a higher gasoline tax rate). The residential UK electricity market was opened for the first time in 1999, introducing choice of supplier, and about 40 percent of households changed supplier in the first four years. After three years price caps were removed. We review this process and assess the competitiveness of the market by examining how the charges levied by suppliers depend on cost and demand factors for three different payment methods and consumption levels. We also identify signs of additional market power of incumbency and the effect of levying a tariff with no fixed charge. We find that both cost and demand factors affect charges, and the relationship varies for different payment methods and consumption levels; and that tariffs with no fixed element have different effects for different payment methods. We also conclude that considerable market power seems to remain with potentially adverse distributional effects. `Oil Equivalence' is widely used to measure total hydrocarbon activity. Natural gas is converted to oil using a fixed factor, usually based on thermal measurement. In turn, expenditures on oil and gas are divided by such `oil equivalence' volumes to define unit costs, especially of reserve additions. This approach lacks economic content. We show its implicit assumptions and constraints, and develop an alternative aggregation method using index numbers, with an example. The high costs for the US economy of mitigating climate change have been cited by the Bush administration as one of the reasons for rejecting US ratification of the Kyoto Protocol. A range of cost estimates are assessed in the IPCC s third report (2001), but they are hedged with so many qualifications that it is not easy to reach useful conclusions. This paper organises some of the quantitative information on costs of greenhouse gas mitigation for the US published before the US rejection of Kyoto. The aim is to put them in a wider context, e.g., allowing for non-climate benefits, and to draw conclusions that are robust in the face of the uncertainties. Important lessons can be drawn for how costs can be reduced in any future international commitment by the US to reduce emissions. Provided policies are expected, gradual and well designed (e.g., through auctioned Annex I tradable permits with revenues used to reduce burdensome tax rates) the net costs for the US of mitigation are likely to be insignificant, that is within the range +/-1% of GDP. A model of successive oligopoly is applied to the European natural gas market. The model has a two-level structure, in which Cournot producers are also Stackelberg leaders with respect to traders, who may be Cournot oligopolists or price takers. Several conclusions emerge. First, successive oligopoly ("double marginalization") yields higher prices and lower consumer welfare than if oligopoly exists only on one level. Second, due to the high concentration of traders, prices are distorted more by market power in trading than in production. Third, trader profits depend on whether producers can price discriminate among consuming sectors; if so, producers collect a greater share of the profits. Finally, when traders increase in number, prices approach competitive levels. Thus, it is important to prevent concentration in the downstream gas market. If oligopolistic trading cannot be prevented, vertical integration should not be discouraged, especially if it would increase the number of traders. This study examines implied volatility from options on crude oil futures surrounding OPEC meetings. Studies suggest that the implied volatility embedded in option prices should drift upward prior to scheduled information releases and drop afterward. As predicted, volatility drifts upward as the meeting approaches and drops by three percent after the first day of the meeting and by five percent over a five-day window period. Surprisingly, highly visible bi-annual conferences experience little drop in volatility. Rather, the most pronounced decline in volatility is associated with meetings of the Ministerial Monitoring Committee, which makes production recommendations to the larger conference. The results have implications for the debate about whether OPEC influences oil prices and provide an explanation for previously documented return anomalies in crude oil futures surrounding OPEC meetings. This paper reviews life cycle analyses of alternative energy technologies in terms of both their private and societal costs (that is, inclusive of externalities and net of taxes and subsidies). The economic viability of renewable energy technologies is shown to be heavily dependent upon the removal of market distortions. 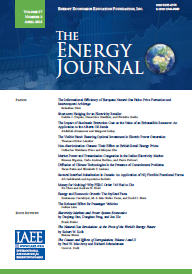 In other words, the removal of subsidies to fossil fuel-based technologies and the appropriate pricing of these fuels to reflect the environmental damage (local, regional, and global) created by their combustion are essential policy strategies for stimulating the development of renewable energy technologies in the stationary power sector. Policy options designed to internalize these externalities are briefly addressed.